KS Kapālama Middle School created opportunities for 640 haumāna to get real-world career advice from professionals. The career day included huaka’i to ʻŌlelo Community Media, Chaminade University, the Kahala Resort and other businesses and organizations. It’s never too early to start supporting a student’s career aspirations. 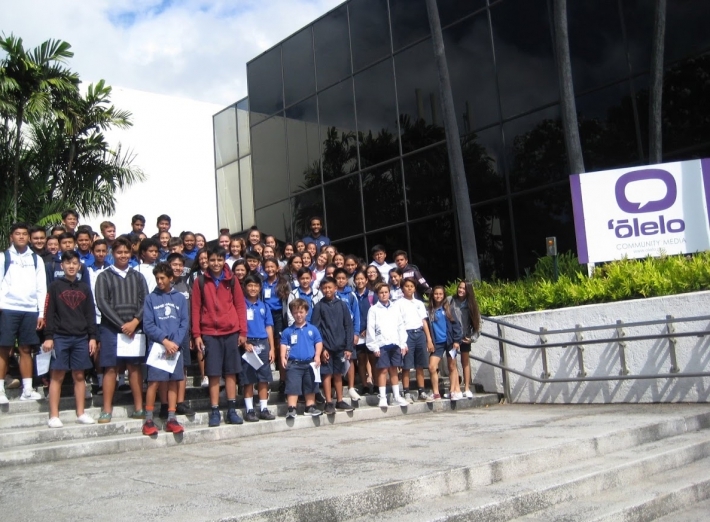 Kamehameha Schools Kapālama Middle School recently created opportunities for 640 haumāna to get real-world career advice from professionals in fields like law, education and engineering. “College and career readiness is a progression, and the middle school level is the ideal time to introduce those concepts,” said Student Activities Coordinator Gail Vannatta. Some students went on huaka‘i to sites including ʻŌlelo Community Media, Chaminade University, and the Kahala Resort. Others stayed on campus to learn from professionals representing the U.S. Secret Service, the Hawaiian Humane Society, the American Heart Association and others. The experience was part of the middle school’s quarterly Extended Learning Opportunity (ELO) day. Haumāna prepare for the learning opportunities, gather information on their journeys, then reflect upon their experiences. Seventh grader Tau Tuikolongahau gained some key information about college scholarships on his huaka‘i. “I learned that Chaminade University is working with Kamehameha Schools so that if you are Native Hawaiian, you can apply to get a free tuition for four years,” he said. Students visiting Chaminade were greeted by scholars from the Ho‘oulu STEM Scholarship Program, a KS partnership aimed at cultivating Hawaiian leaders who are grounded in both science and their native culture. Vannatta and her team send a heartfelt “mahalo” to the following KS staffers for helping make the career day a success: Career Pathways Senior Project Manager Michel Arakaki, KS Kapālama Operations Support Director Alison Leary, and staffers from Recruitment Services, Planning and Architecture, and Commercial Real Estate who served as career presenters.